The three winning brews from the 2006 Samuel Adams American Homebrew Contest are now available nationally in the Samuel Adams LongShot mix six-pack. The homebrews, which include an Old Ale by Don Oliver of California and a Dortmunder Export brewed by Bruce Stott from Massachusetts, were chosen from more than 1,500 consumer entries. 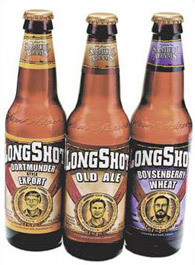 Rounding out the variety pack is a Boysenberry Wheat, submitted by Samuel Adams employee winner Ken Smith from Colorado. Boston Beer also has posted the rules for the 2007 Samuel Adams American Homebrew Contest. Entries must be received between April 15 and May 1. The winners will be announced in October at the 2007 Great American Beer Festival. – Magic Hat Brewing Co. will ship hI.P.A. to mark the return of spring (kind of important to the folks in chilly Vermont). A more heavily-hopped version of IPA, hI.P.A. featrues exclusive artwork from legendary 1960s design icon Stanley Mouse. From his distinctive hot rod illustrations to posters that defined the 1960s concert experience, Mouse placed his creative stamp on an entire generation.